Mason’s bowling rosters don’t have many seniors, but they have bowlers who love being together and competing. 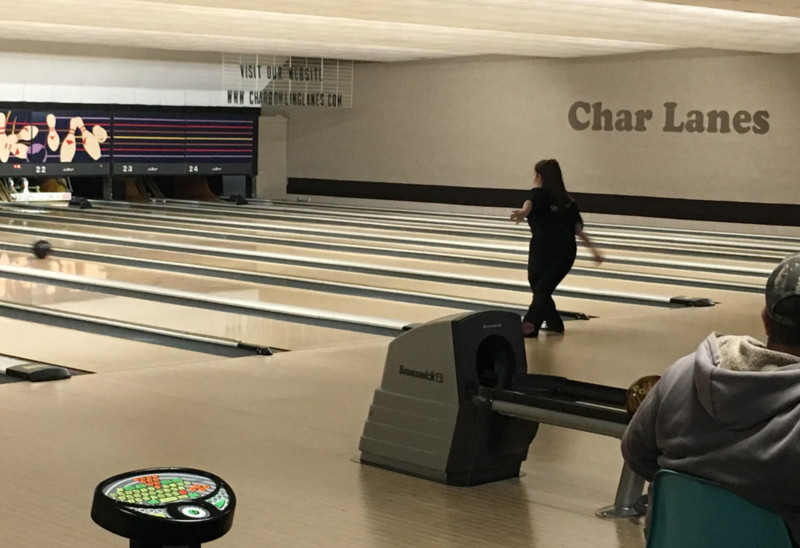 CHARLOTTE, Mich. – Mason High’s bowling teams don’t feature rosters laden with seniors or prep experience. But their seasons are still turning out OK, thanks to squads that are close-knit and talented. The boy's varsity team only has two seniors out of 11 bowlers, while the girl's varsity only has one senior and two juniors out of 14. The girl's team is undefeated, at 6-0, while the boys are at 2-3-1. The coach goes over the game plan with the squad. “We’re pretty good, we’ve gotten better over the few months that we’ve been through this year,” Hendershot said. The girls recently won against Charlotte, 17-13, and Eaton Rapids, 30-0. The team has a good cohesion, even though it is young, according to sophomore captain Grace Ann Whipple. “The majority of our team is sophomores, and we’ve known each other for a while, so I think just sort of the whole family aspect that we have and we are a very tight-knit group,” Whipple said. The youth is an asset, according to boys varsity co-captain Hayden Kuch, as it sets Mason up to be strong for the long run. “Just trying to get the other guys set up for when we’re gone, it’s been a difficult task, but I think we’re getting there.” Kuch, a senior said. Coach Jim Valentine likes his team’s work ethic, something that doesn’t often come readily to a younger team. The boy's team lost to both Charlotte, 29-1, and to Eaton Rapids, 18-12. Despite the losses, Valentine said the team improved from Thursday to Friday’s matches. “They bowled a 100 percent better,” Valentine said. 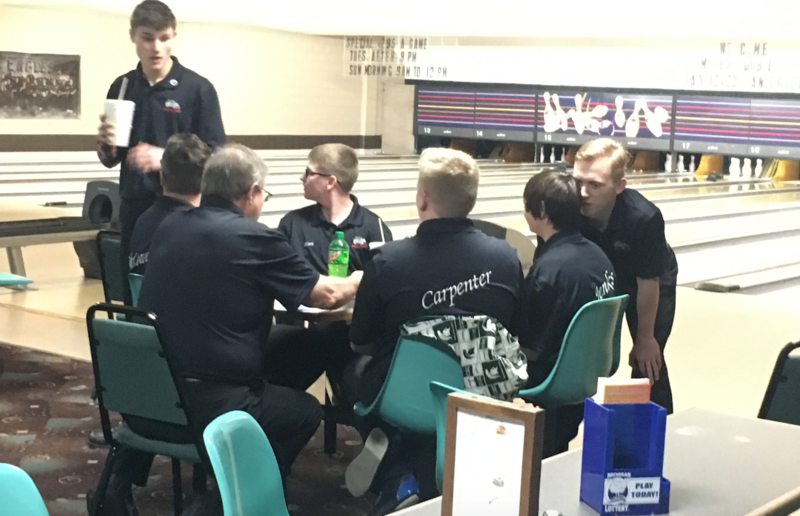 Valentine noted that his team didn’t finish Eaton Rapids off, after a game in which Mason won by over 300 pins. “I got to teach them how to finish, for some reason we can’t seem to finish,” Valentine added. Varsity senior co-captain Jordan McCowan likes how the team is showing cohesiveness. “Definitely we always stick together, we have our bad days with good days, but we always stay together,” McCowan said. Emilee Hendershot releases the ball. Kuch added, “We are always pretty close, we can usually talk to each other about stuff that is going on in our lives, that has nothing to do with bowling. Valentine has had previous success with his teams, leading over five different Mason High School bowling teams to regionals, including a state title one year during his 12 years with the team. Valentine sees the potential for this young boys team and says the sky is the limit for them. “We are striving for regionals, we want to be one of the three teams that go to the states,” Valentine said. Valentine added that maybe two or three bowlers could advance to the singles portion of regionals based on early season success.